Welcome to our VIP Rewards Program. We understand that the referral of a family member or friend to our office is the “Ultimate Compliment.” We also want you to know that we appreciate your referrals and that we would love to have more patients that are just like YOU. 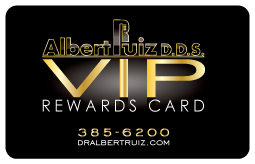 In gratitude for your referrals, the office of Dr. Albert Ruiz has developed a rewards program to show our appreciation. The program is simple, every time you refer a family member or friend you will receive a $25 credit to your office account or a Gift Card to a retailer or restaurant of your choice. After five adult referrals, you automatically become a “VIP” member of the office of Dr. Ruiz and will receive our exclusive VIP Member Card. VIP Membership Benefits will continue as long as you are a active patient of our office and continue active in your referrals. Do not show on scheduled and confirmed appointments. Existence of any unpaid balances. We reserve the right to cancel, change or add benefits to this program at any time and without notice. VIP Benefits for patients with dental insurance will only include, Gift Certificates and Free Teeth Whitening.